Biologist, Jaime Pawelek, is surveying native bees within the entire 73,000+ acre research reserve, which includes state forests, state parks, and conservation lands. The reserve spans two counties and is located along the northeast coast of Florida from Ponte Vedra Beach to just south of the city of Marineland. Jaime is working with bee biologist Dr. Glenn Hall at the University of Florida who has been documenting and surveying native bees for several years. His surveys have focused on areas surrounding Gainesville and include several preserves and nearby farms. In the course of his work he has been able to extend the known ranges of several species of native bees as well as discovered a new squash bee to Florida, Xenoglossa kansensis, on organic farms. 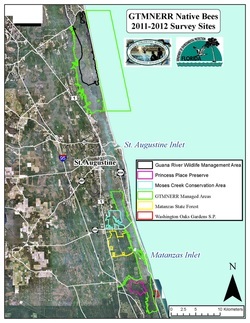 The GTMNERR has coastal, estuarine, and upland habitats making it a unique area to study. From east to west it transitions from beach into dunes and on into coastal strand. Estuarine habitats include tidal marsh and oyster reefs, and the northern most reaches of the red and black mangrove are found within the reserve. Upland habitats are a diverse mixture of maritime and xeric hammock, mesic flatwoods, shell mounds, and scrubby flatwoods.